It may be cold outside, but we're already warming up for a big batch of Spring releases! 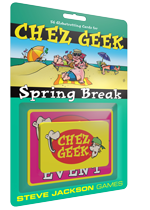 The Chez Geek crew hits the road for a Chez Geek Spring Break vacation! Pick up the Slack at exotic locations, but watch out for travel impediments like an Unexpected Blizzard! This expansion includes over-sized Event cards to let players change the rules. Soak up some sun and Slack off! You want more dungeons? Do you REALLY want more dungeons? Then you're in luck! 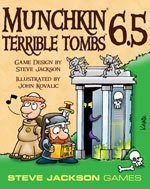 Munchkin 6.5 -- Terrible Tombs adds 20 dungeons and 16 portals to mix with your other dungeons sets. Mix this expansion with Munchkin 6 -- Demented Dungeons to push your party to the brink of sanity! This is an expansion for Munchkin 6 -- Demented Dungeons (or any product using Dungeon cards), it is not a stand-alone game. Cat people had their time, now the dog lovers will have their day! 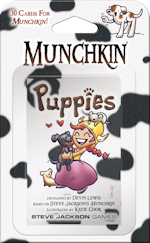 Munchkin Puppies includes 30 new cards portraying a prolific pack of puppies. They're cute, but I hear they haven't been dungeon-broken yet, and require some training. But watch out, they're ruff customers! It's Spyke versus the octopus, and Spyke is pretty sure he's winning! Maybe? The octopus has other ideas it seems. This playmat has areas for all your Munchkin cards and stat-keeping, and features vivid art from Ian McGinty. Your Friendly Local Game Store can preorder these items for you; just ask them!